A children's hospital in Aleppo, Syria, has been hit in recent air strikes. 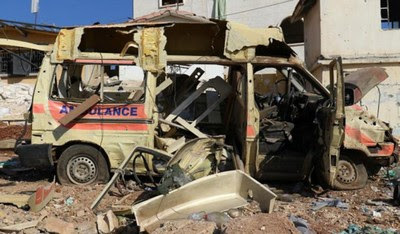 A driver of ambulance and at least two children died after a night of shelling. “Where?” Asks the first child, the less wary one. “Where?” Repeated the other one, the more thoughtful child. “Which?” Says the first, the most talkative among them. “Which?” Inquires the other, the only apparently devoid of originality between the two. “Now?” Asks the usual child, the more hopeful one. “Oops, what careless... I did not say when? Now and in all forgotten priors, at any short or long days instant, more than ever in each fundamental parentheses preceding the obtuse endings. “Now?” Inevitable echoes the other, with slower imagination, but no less eager to believe. “Here I am”, exclaims the first following the unlikely captain. “Here I am”, screams the other joining to the crew. Fragile as the illusion that you can really change the most cruel tales just rewriting them. “But it's only an ambulance…” Says the first looking at the latter, over the debris that slowly try arrogantly to bring everything back to normal fierce. “But it's only an ambulance…” Observes the other, now that he had become convinced of being awake. “I am humbly sorry for that,” murmurs the fading afterglow of a mistreated martyr even in death.